Every day will be a vacation when you walk into this spacious three-story lakefront home. This home has 4,200 sf of living space, 2-car garage, newly remodeled kitchen and an amazing view from all three levels. You will walk through the front door to see a huge family room and open kitchen. This level has wall-to-wall bamboo floors, new cabinets and countertops in the kitchen, skylights and a beautiful rock fireplace. Off to one side you will find the master bedroom with a large walk in closet and upgraded shower and bathtub in the on suite bathroom. On the other side you will find the formal dining room, half bath, and garage. On the balcony sits a hot tub perfect for relaxing and taking in the view. Down one level are 3 more bedrooms, another large living space, laundry room with sink, 2 more updated bathrooms and plenty of storage space. This level has carpet throughout with the exception of the bathrooms and laundry room. It also has another balcony. Down on the bottom level is another great room, half bath, and two rooms big enough to be bedrooms or maybe a theatre room. This level also has carpet throughout with the exception of the bathroom. The deck on this level has a staircase leading down to the back yard, gazebo, and boat dock. From top to bottom this. 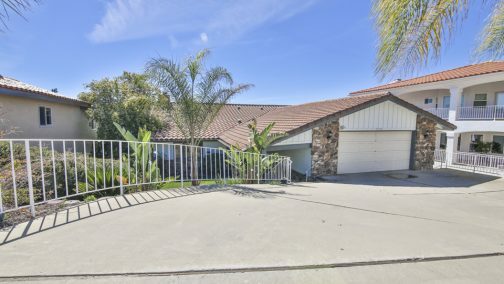 Homes For Sale in Canyon Lake!